"If you five want to risk your lives, go ahead, but count me out. I'm looking out for what's most important: me." Ahkmou is a treacherous Po-Matoran native to Metru Nui. Ahkmou was a Po-Matoran who had a rather selfish personality and, on Metru Nui, had a tendency to make a number of jokes at the expense of others. On Metru Nui he worked and lived as a builder and Carver in Po-Metru. He was skilled at many things in his work but master of none, and he never forgot all of the times he had fallen short to Onewa, another Po-Matoran Carver. This rivalry led Ahkmou to bitterness and resentment. Ahkmou was acquainted with the Ko-Matoran Ehrye, and the two often played Akilini. Ahkmou came to be one of six Matoran (Nuhrii, Orkahm, Vhisola, Tehutti, Ehrye, and himself) who each knew the hidden location of one of the six Great Disks. This attracted the attention of the Dark Hunters Nidhiki and Krekka, who had recently arrived in Metru Nui. The cunning Nidhiki used Ahkmou's rivalry with Onewa to convince him to help him obtain all of the Great Disks. He promised Ahkmou that he would be well-paid and that he would not disturb Ahkmou any longer once he had completed the task. To help him in his mission, Nidhiki gave Ahkmou the names of the other five Matoran who knew where the Great Disks could be found, and Ahkmou sent a variety of false messages to the other five Matoran that led each of them into traps set up by Nidhiki. Meanwhile, shortly after another six Matoran had been transformed into the Toa Metru, Toa Vakama received a vision showing him that the six Great Disks were needed to defeat the Morbuzakh, and the names of the Matoran who knew their locations. This prompted the Toa Metru to set out and find the Matoran, who had each mysteriously disappeared due to Ahkmou's actions. After Vhisola, Nuhrii, and Tehutti were rescued by Nokama, Vakama, and Whenua, Nidhiki grew impatient with Ahkmou and introduced him to Krekka, his hulking brute of a partner, as a threat to complete his task without fail. To play the part of a Matoran in peril, Ahkmou had Toa Onewa find him "trapped" on top of a large sculpture in the Po-Metru Sculpture Fields. Onewa was aware that Ahkmou was not in any real danger, as Ahkmou often climbed sculptures like that one for fun. When Onewa showed suspicion, Ahkmou tried to flee to Chute Station 445, the busiest transport hub in Po-Metru, as a carved message left by Nidhiki on top of the sculpture had suggested. Onewa saw the message as well and caught Ahkmou at the Chute Station before he could escape in the Chute System. It was when Onewa caught a glimpse of Nidhiki, watching from the shadows, that he began to understand. Ahkmou reluctantly agreed to side with Onewa. Having found all six of the missing Matoran, the Toa Metru met at the Great Temple. Vakama suspected that one of the Matoran set the others up, and after discussing all the clues they had noticed, they realized it was most likely Ahkmou. Because all six of the Matoran were still needed, they agreed to keep that suspicion quiet for the moment. Ahkmou accompanied Vakama, Onewa, and Nuhrii in finding the Ta-Metru Great Disk in the Fire Pits and the Po-Metru Great Disk in the Sculpture Fields, but did not participate in their retrieval. Ahkmou had informed Onewa that the Po-Metru Great Disk was on top of the "mountain in balance" sculpture in the Po-Metru Sculpture Fields. Once the Toa Metru had collected all of the Great Disks, they went with the Matoran to Ta-Metru to face the King Root of the Morbuzakh in the Great Furnace in Ta-Metru. Along the way, they walked through an abandoned building with a ceiling lined with Morbuzakh seeds. After narrowly escaping the building after the seeds started dropping on them and sprouting, Ahkmou tried to run. At this point, Onewa realized that Ahkmou was definitely the traitor and confronted him about it. When the group reached the hallway leading into the Great Furnace, the Toa Metru entered while the Matoran were told to stay behind. When the Toa Metru were nearly defeated when Morbuzakh vines attacked and shot hundreds of thorns at them, Ahkmou formed a Matoran Nui with Nuhrii, Orkahm, Vhisola, Tehutti and Ehrye to help the Toa Metru escape into the main chamber and battle the Morbuzakh. After the Matoran split again, Ahkmou went off on his own to pursue his own destiny. Shortly after this, he was captured by the Vahki and put into a Matoran Sphere. It was there that he fell into a deep sleep and would lose his memory due to his prolonged stay in the sphere. His sphere was presumably carried by a Vahki Transport to a large storage area beneath the Coliseum along with all of the other Matoran of Metru Nui. Just after the Great Cataclysm struck Metru Nui, the Toa Metru rescued him in his sphere from beneath the Akilini field of the Coliseum to take him on their voyage to Mata Nui. They fastened his sphere to the bottom of the Lhikan, a Vahki Transport they traveled in and their makeshift sea vessel, to keep it afloat. While traveling through the subterranean rivers leading to Mata Nui, the Toa Metru lost his sphere to the riverbed when a massive wave created by Mavrah's Rahi rocked the vessel and loosened his sphere. Teridax later found his sphere resting on the bottom of the river and awakened him with his own power. Teridax told Ahkmou everything about Metru Nui, and told him lies that convinced him that the Toa Metru and Matoran had abandoned him. Teridax sent Ahkmou to Mata Nui to secretly work for him as a Trader in Po-Koro. Ahkmou came into the Po-Koro community as a latecomer, but none of the other Matoran questioned his sudden appearance, as their memories were still recovering from the Matoran Spheres. Ahkmou's body had shrunken along with all of the other Matoran as a result of being in his sphere for too long. When Turaga Onewa realized what Ahkmou knew, he sternly told Ahkmou not to reveal any of Metru Nui's secrets to any of the Matoran. Once in Po-Koro, Ahkmou attempted to make a living by selling "lucky Ghekula" to superstitious Matoran. Turaga Onewa put a stop to this. Ahkmou later sold Kolhii balls infected with Teridax's influence, called Comets, to the Matoran of Po-Koro. The Comets became a fad among the Po-Matoran, and the Po-Koro population quickly fell ill. As revenge for an injury he never actually sustained, the vindictive Ahkmou made sure Hewkii was among the first to become sick. Thanks to Takua, however, the source of the infected Kolhii balls was discovered in a Nui-Jaga nest inside the Po-Wahi Quarry, and Toa Mata Pohatu destroyed the infected Kolhii balls in the Quarry. Before the Matoran dumped all of the infected Kolhii balls, Ahkmou fled, leaving only a sign at Ahkmou's stand saying "Gone Fishing." After some time, Ahkmou later returned to Po-Koro. At this point, Turaga Onewa knew that Ahkmou was allied with Teridax. During the Bohrok invasion of Po-Koro in the Bohrok Invasion, Ahkmou and the other Po-Matoran were evacuated to Ga-Koro and returned to their own village after the Bohrok were defeated by the Toa. After the Toa Nuva defeated the Bohrok-Kal, Ahkmou's body was changed to a larger, more agile shape along with all the other Matoran using the Turaga's knowledge of reconstruction. Ahkmou continued to work as a shopkeeper in Po-Koro, and did not misbehave again. Believing that Teridax had died after Takanuva defeated him and rediscovered Metru Nui for the Turaga, Ahkmou at first helped the Po-Matoran widen the tunnels leading to the Silver Sea. When everything was ready, Ahkmou sailed to Metru Nui with all of the other Matoran. Ahkmou was the intended target of a Shadow Leech attack by Makuta Icarax, but it instead attacked Takanuva. After Makuta Teridax took over the Matoran Universe, Ahkmou was appointed as the "Turaga" of Metru Nui. With his new authority, Ahkmou banned all unauthorized artwork in the city, removed all previous statues of Toa, and ordered all Po-Matoran to carve statues of Teridax. When Teridax was killed, Ahkmou left the universe for Spherus Magna,[OGDi: Apr 4 2010, 12:11 PM][OGDi: Apr 7 2010, 01:19 PM] and he is trying to ingratiate himself with the Glatorian. In this alternate universe, Ahkmou was a part of a resistance team led by Pohatu and Lesovikk. Prior to Takanuva's first meeting with the team, Ahkmou was sent to gather all the Makuta in the city to assist in the rebellion against Tuyet. Later, during a battle outside the Coliseum, Ahkmou assisted Krakua in killing Gali, but was then frozen by Kopaka and smashed by Onua, killing him. For his whole life, Ahkmou has always been out for only himself. On Metru Nui, he worked for Nidhiki, trying to get the Great Disks for him, as a deal to protect himself. Later on, he double-crossed the Dark Hunters, allying with the Toa Metru to get protection when he failed to get the Great Disks. When the Toa Metru brought along the Matoran Spheres to Mata Nui, Ahkmou's was lost, and Teridax filled Ahkmou's blank mind with lies. Teridax told Ahkmou that he was destined to be a Toa, but the Toa Metru kept him from that Destiny. Having few morals, he took advantage of superstitious Matoran, on both Metru Nui and Mata Nui, just to make a profit. The only time he actually helped the Toa out of the goodness of his heart was when he formed a Matoran Nui with five other Matoran on Metru Nui. He was an excellent carver on Metru Nui, but always envied Onewa's greater skills. A great climber, he also climbed up statues and sculptures for practical jokes. When he became a salesman, he sold "Lucky Ghekula" before selling Infected Comet Balls, which took the skills of both Takua and Pohatu to expose. Like all Po-Matoran, Ahkmou is stronger than Matoran of other Elements. Ahkmou often carried a level three Kanoka disk with the regeneration power and a code of 373, perfect for repairing mistakes made when carving. As with most Carvers, he also carried standard issue carving tools. 8610 Ahkmou was released in early 2004 as one of the Metru Nui Matoran sets. 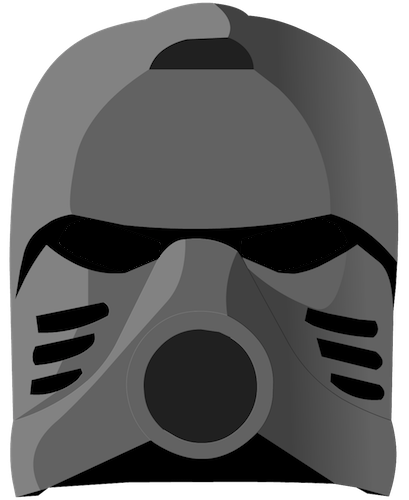 Ahkmou wore a light brown Kanohi Rau with silver markings on top of the mask. The set also included a Kanoka Disk Launcher and a glow-in-the-dark Po-Metru Kanoka disk with a special code on it. This could be entered at the BIONICLE website for Kanoka Club points. Ahkmou could also be combined with 8607 Nuhrii and 8611 Orkahm to create the Kinloka combiner. "His last memory was sitting in the Coliseum and feeling a great weakness come over him. Strangely enough, for a Matoran who had attempted to betray the Toa Metru and the city, his last thoughts were: Where are the Toa? Why are they not here to save me?" "As he listened to the intricate web of lies spun by Makuta, he vowed he would have revenge on Toa, Turaga and Matoran, wherever they might hide." "Better to keep a doom viper beside your bed than to let it wander free. At least then, you will know from which direction its strike will come." The BIONICLE story team idly considered transforming Ahkmou into a Toa of Shadow to play a large story role in 2008. Although this plan did not come to fruition, in the final story Icarax did travel to Metru Nui to drain Ahkmou's light. However, when the Makuta arrived, he seized an opportunity and attacked Takanuva rather than Ahkmou.